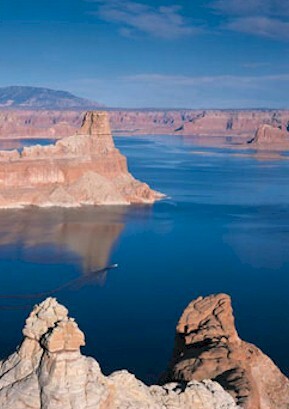 Lake Powell, the second largest man made reservoir in the United States, is at historical low levels. 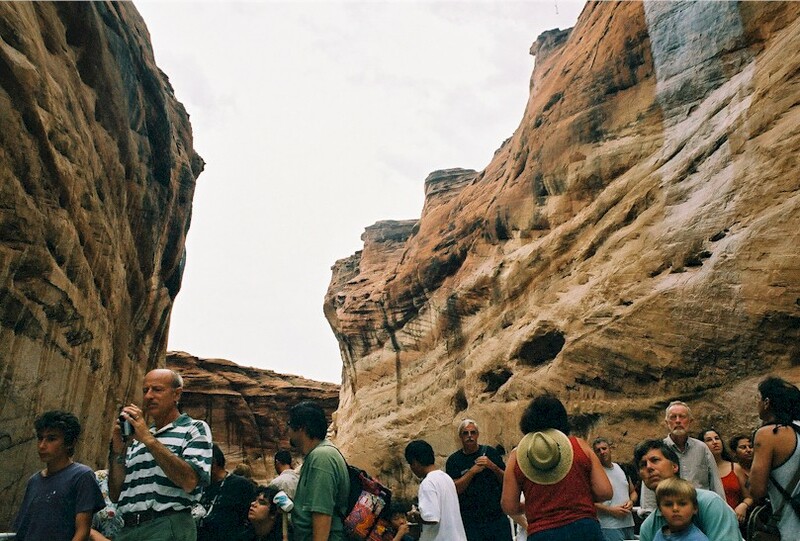 In September of 2003, when this page was being updated, it was down almost 100 feet (see picture below, second from the right, where the water level normally reaches the top of the cliffs). This means that there has never been a better time to see the lake! 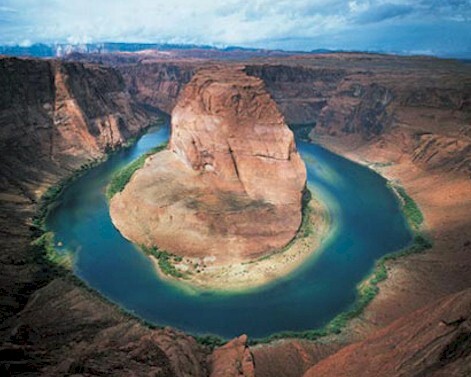 Almost all of our Grand Canyon tours stop at Lake Powell. 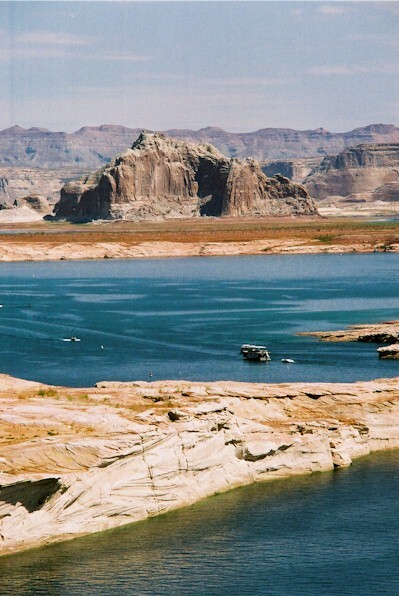 Lake Powell was formed when the Glen Canyon Dam was flooded, drowning literally hundreds of canyons. Today it is possible to take a boat through these canyons and see the colorful rock cliffs and shapes towering from the blue waters. With the water so low, you can see sites that have not been visible since the dam was flooded in the 1960's. 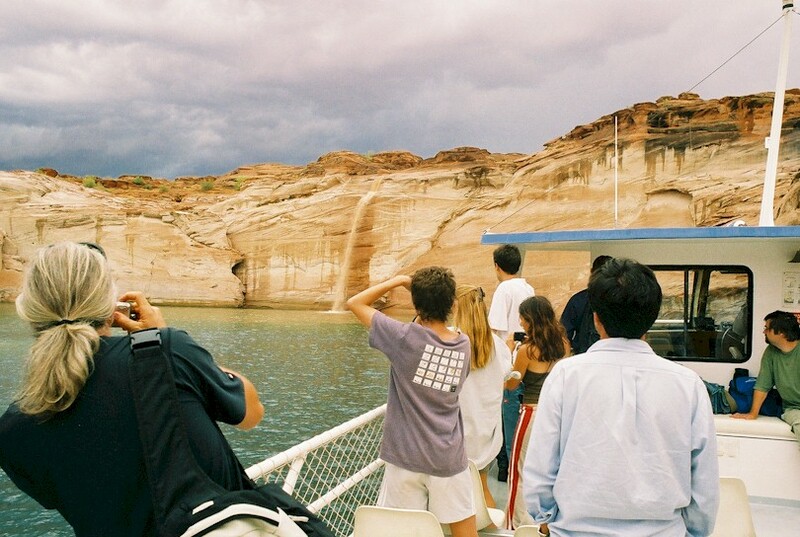 You can take a variety of boat cruises through the canyon walls, with the most spectacular being the day trip to Rainbow Bridge. The road to Page, the little town on Lake Powell, takes you through Navajo Nation land, where you will have the opportunity of sampling fry bread and Navajo Tacos, while you shop for turquoise jewelry from roadside stands. Depending on where you're coming from, you may also travel alongside the Vermilion Cliffs, which radiate amazing colors at sunset and sunrise. Conservationists believe that Glen Canyon Dam was a huge mistake, drowning, as it did, approximately 183 miles of canyon country back into Utah. 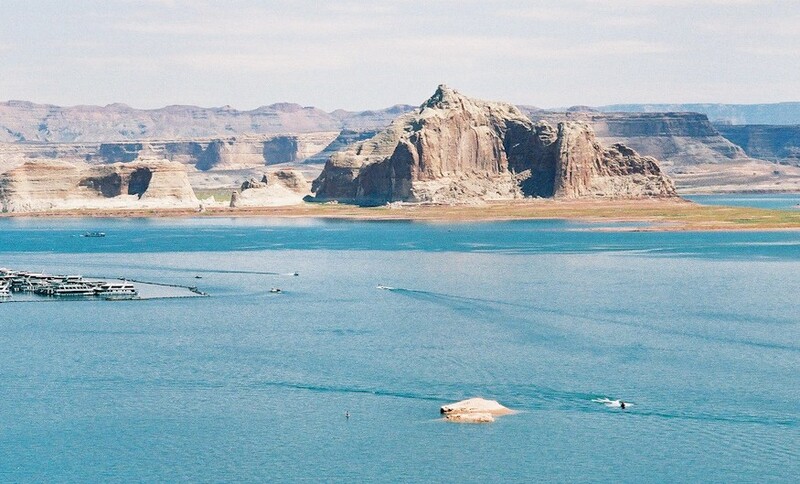 Agree or not, millions of people every year visit Lake Powell and Page, to take in the incredible sights of the colorful canyons and rocks towering from the blue waters. 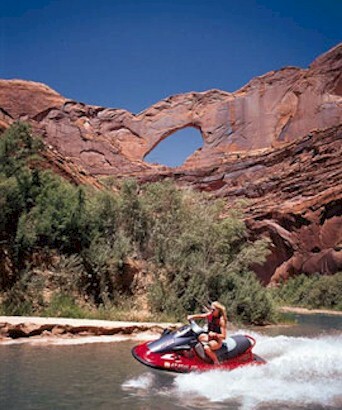 Zion Tours offers two types of tours to Lake Powell. Shared multi day tours of Zion, Lake Powell, as well as the Grand Canyon, Bryce Canyon, Monument Valley, Arches and Canyonlands, to name a few. Custom designed tours of the above areas, and many others, just for your group.